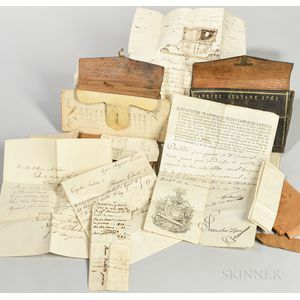 Sistare Family, Late 18th and Early 19th c. Archive of Documents and Wallets. Sistare Family, Late 18th and Early 19th c. Archive of Documents and Wallets. Including a black gold-tooled morocco wallet dated 1761 and tooled with the name Gabriel Sistare (1725-1795); an autograph letter addressed to Gabriel Jr. (b. 1754) from his father-in-law Joseph Chew, signed by Chew, Montreal 15 November 1796, concerning Sistare's status, "I cannot help thinking your being detained, was for want of a proper representation, of your coming so young to America, of your being an inhabitant of New London in Connecticut at least 23 years, that during the American War you never acted against Great Britain"; a red morocco wallet that belonged to the William Sistare who served as Quartermaster, including documents related to that role (including his discharge and other papers); a tanned leather wallet; three tintypes; an ambrotype; and other printed material. Captain William Sistare was a sea captain of New London, Connecticut, his father, Captain Gabriel Sistare, was born in Barcelona, Spain, in 1726, immigrated to New London in 1771, and died in 1795. He had a son from his first wife, in Spain in 1754, also named Gabriel. This Gabriel married Frances Chew and had one son, named Joseph in 1774. William M. Sistare was born in New London in 1794. He was a merchant, and Quartermaster in the War of 1812.